Home > Blog > Art & Culture > Turkey Day Trivia! Thanksgiving is one of those holidays that tends to revolve around family and food. If you’re looking for a good conversation starter, these interesting facts will make you seem like the smartest person at the dinner table. The woman behind “Mary Had a Little Lamb” is also responsible for Thanksgiving’s recognition as a national holiday. In 1953, a Swanson employee accidentally ordered a colossal shipment of Thanksgiving turkeys (260 tons, to be exact). 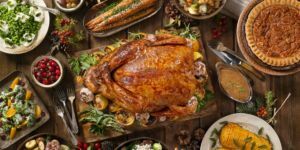 To get rid of them all, salesman Gerry Thomas came up with the idea of filling 5,000 aluminum trays with the turkey – along with cornbread dressing, gravy, peas and sweet potatoes. They were sold for 98 cents and were a hit. Within one year, over 10 million were sold. The turkeys pardoned by the president go on to do some pretty cool things. President George H.W. Bush pardoned the first turkey in 1989, and it’s a tradition that persists today. But what happens to the lucky bird that doesn’t get served with a side of mashed potatoes? In 2005 and 2009, the turkeys were sent to Disneyland and Walt Disney World parks to serve as grand marshal in their annual Thanksgiving parades. Almost eight in 10 agree that the second helpings of stuffing, mashed potatoes and pie beat out the big dinner itself, according to a 2015 Harris Poll. The Butterball Turkey Talk Line answers almost 100,000 calls each season. Last year, the company’s popular cooking crisis management team also introduced a 24-hour text message line for the lead-up into the big day.